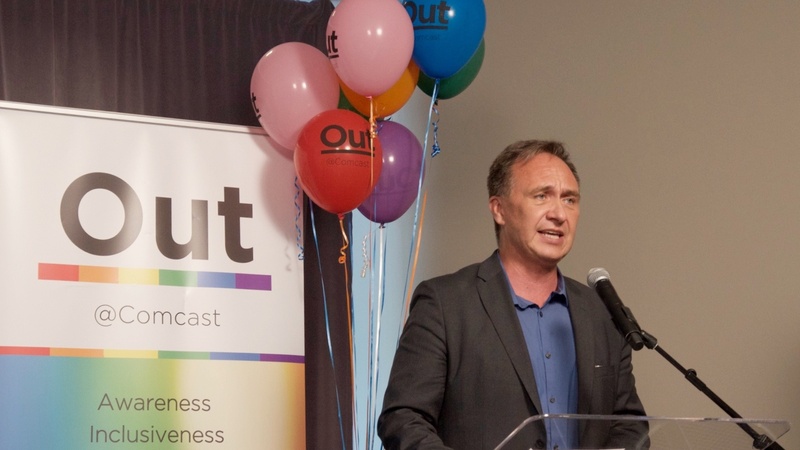 A few days ago I was invited to Comcast California’s regional offices in Livermore for the launch of OUT, their newest LGBTQ Employee Resource Group in California. I was pleasantly surprised with a $35,000 donation from the Comcast Foundation that will serve to continue to empower LGBTQ youth in our state. Comcast’s commitment to the LGBTQ community and Equality California is not new. For the past seven years, the Comcast Foundation has funded the Equality California-Comcast Fellowship. The Equality California-Comcast Fellowship is a leadership development program in which six exceptional LGBTQ or ally college students are placed in the offices of California legislators or other government officials. Fellows gain first-hand experience working with legislators, government officials and their staff, and develop key leadership skills. Their presence increases LGBTQ visibility in the Capitol and gives government officials direct interaction with members of the LGBTQ community. It is more important now than ever to make sure we have adequately prepared the next generation of LGBTQ leadership. Our partnership with the Comcast Foundation helps address the traditional under representation of LGBTQ people in government and helps advance equality by familiarizing people in the California Capitol with LGBTQ people and the challenges we face. Emily Paciulla, from Davis, is a senior majoring in management at Georgetown University. She is the President and a founding member of the McDonough Alliance, the first LGBTQ business group at Georgetown. She also hosts a two-hour, weekly program on Georgetown’s WGTB radio and has worked with middle school students on strategies to curb the spread of HIV in their communities. Christina Parker, from Yucca Valley, is a senior majoring in Arabic language, culture and literature at California State University, San Bernardino. She is chair of the San Bernardino Chapter of California Youth Connection, where she empowers youth to use legislation, policy, and advocacy to transform the foster care system, and has met with state assembly members, senators and their staff to advocate for bills affecting foster youth. This year’s fellows will be placed with the offices of Senators Scott Wiener and Henry Stern and assembly members Susan Eggman, Laura Friedman, Evan Low and Blanca Rubio. This is an example of how corporations can help create a better, fair and more equal America for everyone. Together we’ll make California a shining example, a beacon of hope for the rest of the country, embracing the values of diversity, inclusion and love.